Can you imagine a world where the rubber eraser or the delete button didn't exist? Neither can we, because fixing mistakes, and changing ideas is one of our deepest needs. Problem solvers have always understood the power of whiteboards, but their giant size & costs don't always make them readily available. It's time you tried getting your own personal whiteboard notebook because you'll be wondering how you managed to survive without it! The Wipebook Scan and Mini Wipebook Scan are the newest family members for the creative innovator in you. 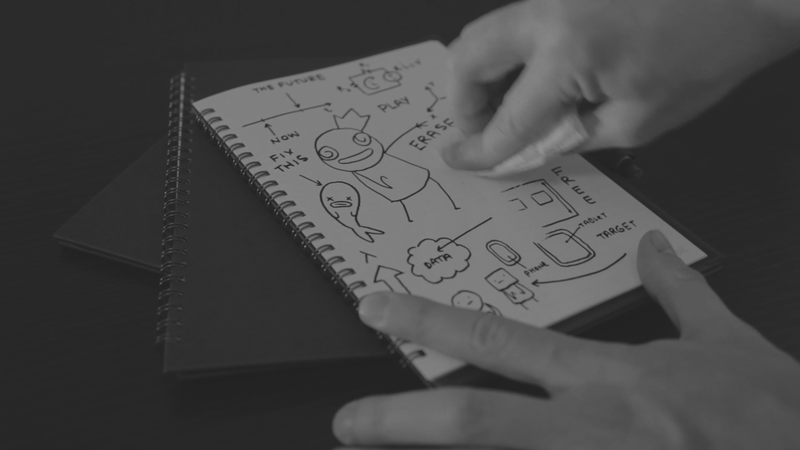 Not only can you erase them like a whiteboard, you can even save your sketches with the new Wipebook Scan App. Wipebooks come in all shapes & sizes. Studies have shown that non-permanent surfaces enhances the engagement of groups working out problems. But wouldn't it be nice if you didn't have to worry about sharing or filling up the one whiteboard in your office or classroom? Then consider filling up all your walls with Wipebook Flipcharts to increase freedom & flexibility when working in teams. Because our whiteboards are made of paper, you essentially have 20 times the writing space of a conventional whiteboard. Some things are just done better on erasable surfaces, so why limit yourself with conventional whiteboards. The tool for innovative teams. What better way to inspire your team or clients than to provide them with the perfect tool for ideation and problem solving. Whether it be a gift for your own staff, or giveaways at an event you are organising, our branded notebooks will definitely differentiate your company from others. Not only is this a useful gift, it's also an eco-friendly alternative to wasteful paper notebooks & swag that gets thrown out. Consider ordering a batch of branded notebooks today for a gift that will surely be kept forever!